And yes, it is *yellow*! Other than that, I can tell you almost nothing. It has two tires (currently flat). It has a seat on which to rest your buttocks. It has pedals (two) - perfect for a biped. The pedals aforementioned turn in a circular fashion. It has some gears and a chain. They seem to be engaged in some kind of relationship. Two - to keep you from falling forward onto the front tire. And did I mention that it's yellow? The yellow is not banana (and neither is the seat). The yellow is not canary. 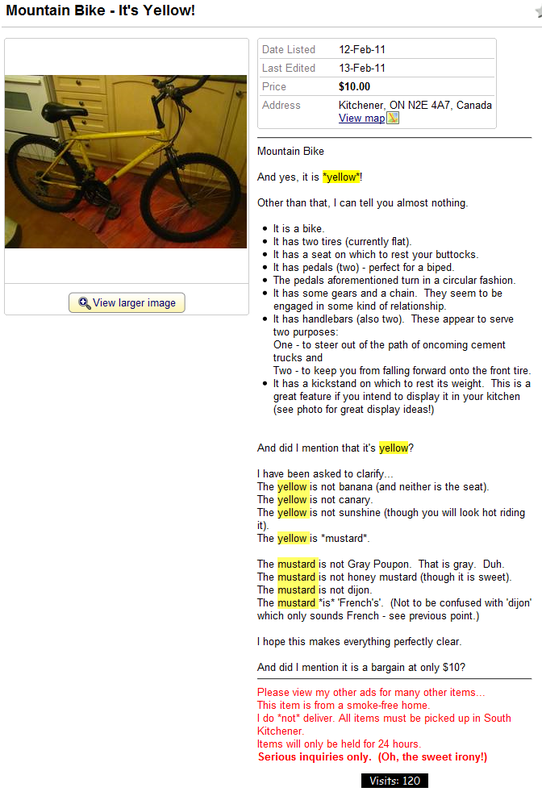 The yellow is not sunshine (though you will look hot riding it). The mustard is not Gray Poupon. That is gray. Duh. The mustard is not honey mustard (though it is sweet). The mustard is not dijon. I hope this makes everything perfectly clear. And did I mention it is a bargain at only $10? This item is from a smoke-free home. I do *not* deliver. All items must be picked up in South Kitchener. Items will only be held for 24 hours.